Computed tomography, or CT scanning, is one of the most powerful diagnostic tools to emerge during my medical career. Just look at the detail in the brain images above, taken at 90 degree angles through the brain. And I was there at the beginning. I remember well when I was a medical student taking neurology and the first CT scanner arrived at the Mayo Clinic. By today’s standards it was incredibly crude. It displayed a tiny image on a cathode ray tube that was then photographed with a Polaroid camera. Preservative lacquer was then smeared on the photograph and it was pasted into the patient’s chart with glue. But the crude photographs were amazingly superior to what physicians had previously, which was nothing. They had skull x-rays to look at the bone and the very painful and very indirect imaging technique called pneumoencephalography. So neurologists and neurosurgeons were ecstatic at the new technology because it allowed them to see the brain directly. Over the years head CT emerging as pretty much a standard test for evaluating any bonk on the head, particularly if the person clinically had a concussion or especially if they lost consciousness. This is because one of the things a head CT does particularly well is identify brain swelling or bleeding inside the skull. But then some concerns began to arise about the radiation that comes with CT scanning. And CT scans do deliver an order of magnitude at least more radiation than do ordinary x-rays like chest, arm, or leg x-rays. So this raised the concern of all these head CT scans contributing to increased cancer risk, a particular concern in children who have developing brains and their life ahead of them. It turns out there is a measurable increase in lifetime cancer risk from CT scans. It’s tiny, but it’s measurable. How tiny? About 2 in 10,000 head CT scans. The risk is higher for abdominal CT scans, but these deliver much higher radiation doses. Radiologists recognized this issue and a decade or more ago instituted protocols for children that reduced radiation significantly (the Image Gently program). But the risk is still there. For small children there is often the additional risk of the need for sedation to do the scan because the child cannot hold still enough to get a sharp image. The point is that we should use the same risk/benefit calculation when ordering a head CT that we use when ordering any other test. If the risk, however tiny, exceeds the expected benefit we shouldn’t do the test. So if the benefit of a head CT in minor head trauma in children is essentially zero we shouldn’t get the scan. But how do we determine that? To help us with that question various professional organizations have issued guidelines regarding when a head CT is needed to evaluate pediatric head trauma and when it’s not. An interesting recent study investigated how we are doing in adhering to those guidelines. You can read one commonly used set of guidelines here. The authors studied the years 2007-13. The guidelines had been recently put in place at the beginning of that period. Their goal was to see any effect of this; they hypothesized that, over a decade, implementation of the guidelines should result in a reduction in pediatric head CT scans. They used the enormous National Hospital Ambulatory Care Medical Survey database, a resource that includes information on over 14 million children who visited an emergency department during the 9 year study period with a diagnosis of head trauma. Their question was crude but simple: Did rates of CT scan use for pediatric head trauma change over the study period? The simple answer they found was: no change. The below graph shows the proportion of children who got head CTs over the study period. 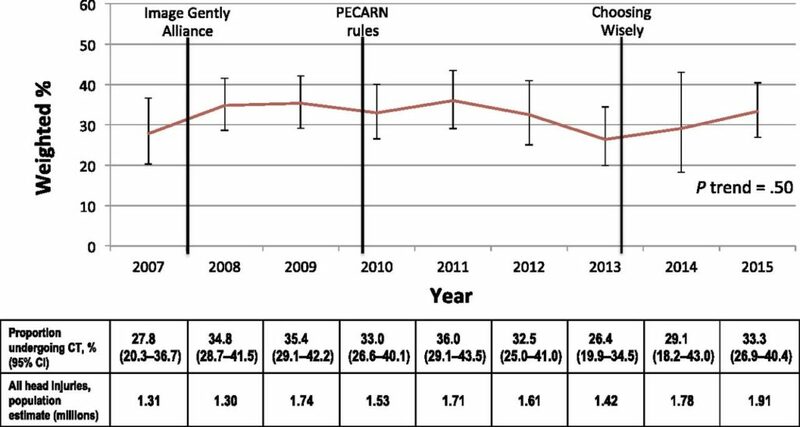 The points of implementation of various guideline initiatives are noted — Image Gently, PECARN Rules (described in the above reference), and Choosing Wisely. But the line is unchanging within the confidence intervals. I suppose we should not be surprised most of this excess CT use occurred at community hospitals rather than academic facilities; up-to-date practice would be more expected to take place at the latter. So what does this mean? An accompanying editorial to the above study considers the implications. It is disappointing that US children have generally not benefited from current best practice research and continue to experience unnecessary radiation exposure. This is a reminder that pediatric research and education efforts are frequently not focused where most US children receive their medical care. . . . A recent study of a community ED revealed that a maintenance of certification program sponsored by a children’s hospital was associated with lowered CT scan use from 29% to 17%. Most discussions of this sort bring up defensive medicine, that is, doing things out of a fear of lawsuits. However, adherence to nationally recognized best practice guidelines is a pretty solid defense against later claims of negligence. In this case, it’s not at all inconceivable that not following best practice guidelines actually puts a physician at risk from being sued.